It was a cool misty morning with the mountain covered in more shades of grey than an E.L. James novel. My pre-race routine was more of a shambles than usual (think Victorian Liberal Party level of disarray) so I missed the Solemates pre-race photos, but I had at least had a chance to say hello to heaps of friends before making my way to the start line. I waited excitedly at the start line as the final seconds ticked down. The race itself started in a slow moving tangle of bodies, so as quick as I could I got onto the outside and sped up, getting a high five from the president as I headed out onto Sandy Bay Road. By the time I passed the University of Tasmania, I was tucked into a group of runners that were getting faster and faster. Remembering the nature of the race ahead I decided to follow the lead of a conservative government with any progressive policy and slow things down sharply. Running at less than my marathon speed, I was feeling very comfortable as we ran through Sandy Bay shopping precinct (it feels a bit pretentious to call that small drag a precinct but if you’re going to be pretentious may as well do it in Sandy Bay so you fit in). The turn up into Byron Street was a pretty abrupt change and I dropped away from my previous pace like Australia falling away from its carbon emissions target and made just as little attempt to do anything about it. The hill wasn’t actually as bad as it looked and before I knew it I was lengthening back into an easy stride as I headed up Davey Street towards the mountain. We passed the Southern Outlet and the ground began to rise again. The slope was gradual at first, but soon quite noticeable. I got a bit of a boost as I climbed to the top of Davey and got an enthusiastic shoutout from Kristy before turning the steep bend and passing the Simpsons (my friends not the cartoon characters) just before the first drinks station. The first drinks stations was heavily populated with runners and walkers who had begun the Point to Pub 30 minutes before we started. Dropped cups and athletes converging on wet ground can make a drinks station as slippery and dangerous as a Bunning Sausage Sizzle (in the crazy days when the onions were placed on top of the sausage), but the hard-working volunteers for this race made a lot of effort to keep the area clear and make it easy to get drinks without risk of collision. As a result, I got through surprisingly easily, picked up my speed and continued on. The climbing road wound its way back and forth, climbing higher towards Ferntree. The road was now filled with walkers and runners so we got plenty of encouragement as we passed. I was heating up too. Normally I make sure I cut my hair short in the month leading up to a race to help reduce overheating. Unfortunately, I hadn’t got around to it this time and needed a haircut as badly as Tasmanians need a payrise. We reached the second drinks stations at the Strickland Avenue turn off, which was again easy to navigate and featured a big crowd of supporters cheering us on and waving placards. The next couple of kilometres flattened out and were a pleasant respite before the main climb to come. I passed Elaine- whose enthusiasm and energy pretty much saved my life in the last leg of Gone Nuts earlier this year- and received a typically cheerful high five and barrage of encouragement as I neared the turn off onto Pinnacle Road, which was the beginning of the second- much more daunting- half of the race. In previous years I have done this event in a very different way as part of the Just Like Jack team so this was really the first time in a couple of decades that I set out to run it as anything resembling a race. As a result, I really wasn’t sure how hard I was going to find it. Much as I might hope for a perfect race (not in the way Fraser Anning, Pauline Hanson or Tony Abbott do, I should add), that seemed unlikely so began the climb to the pinnacle cautiously. ​The change in gradient was quickly noticeable so I allowed myself to slow a little to ensure I was minimising fatigue this early in the race. I was overtaken by a few runners over the next couple of kilometres as we made our way up towards the Springs. Normally when I get overtaken I try to stick with the person who has just gone past me and use them to drag me along for a while, but today I resisted this impulse and just kept chugging away at a speed that felt right for me. The Springs itself was the site for another drinks station, which was a lot less crowded than the first two. With the heavy concentration of Solemates volunteering at this station, it should really be renamed the Solemates Straight and I got a heap of cheers from Ryan, Hayley and Trent as I ran through. The road continued to climb higher, getting steeper as we went. The clouds I had seen from sea level had not risen much and shortly after passing the Springs, I was running through grey mists that were so thick I didn’t even recognise Alice when she cruised past me at the 15km mark. The damp clouds pressed in closer giving a slightly eerie atmosphere and prompting me to start rehearsing “expecto patronum,” under my breath in case a dementor appeared (my patronus is an echidna for those people who were wondering- and if you weren’t wondering about that you probably should have been). I almost ran into Gabby and Toby, who were lurking in the mists near The Chalet, providing a last bit of encouragement to get us up the hardest part of the climb. It certainly gave me a boost, but there was also something a little out of place. I'm so used to seeing Gabby smashing out these events herself that seeing her on the sidelines was a bit like seeing a story about Megan Markle's clothing choices in a news publication- they just don't belong there. Soon afterwards, the gradient lessened slightly, although it took a while for my legs to believe it was happening. I was actually coming out above the clouds as I rounded the big 180 degree bend and began to make my way back along the top of the mountain to the summit. My legs were grinding like a pair of teenagers at a disco, but I felt pretty confident that I would finish the race without any real drop in pace from here. I hung around near the top of the mountain for some time after the race. Once I had shaken hands with Race Director Tim Smith, who does a magnificent job every year, I jumped onto the gear bus and fished out my backpack so I could throw on some warmer clothes and tuck into a bag of pretzels. 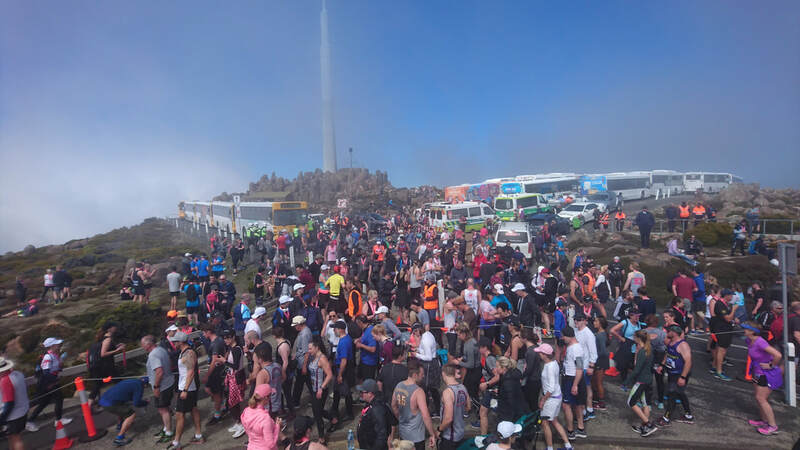 ​It was great seeing so many friends at the finish- especially after some particularly epic performances from Jackson, Naomi, Jackie and Lauren- and watching the Just Like Jack teams cross the line, but after about an hour on the summit, I knew I had to get going. Any other day, the thought of travelling to the casino would make me feel slightly ill (that’s not a joke I just haven’t forgiven the Federal Group for their dishonest interference in the 2018 state election or for the damage poker machines do to the lives of problem gamblers), but today I was pretty happy to be getting on a bus and heading back down the mountain. Soon enough I was in my car and on my way home. I enjoyed the opportunity to have a bit of a crack at the race this year, but also found aspects of it uniquely challenging. I also love the photos provided by event partner, Race Atlas, which were available to athletes for free, unlike most races I have run. Not sure what I will do for it next year, but no doubt I will be involved in this great event one way or another.